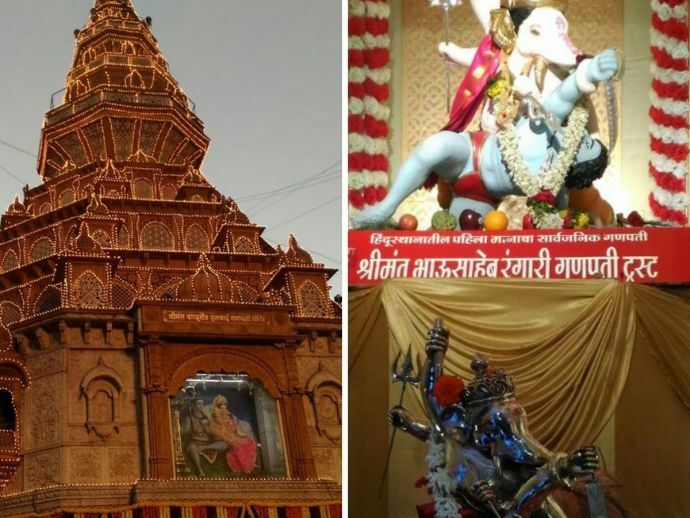 5 Ganeshotsav Pandals In Pune You Should Not Miss Out On! Let the pandal hopping begin! While majority of Punekars are still spending time with their beloved Bappa at home, the streets are getting busier. Now that Gauri Visarjan has happened, you will find Punekars doing pandal hopping everywhere . This goes without saying. With every year, the beautiful Ganesh idol seems to glow more. The pandal gleams in the dark and it’s a sight worth seeing. Gold and glitter, this pandal must definitely be on your bucket list. We all know that it was Lokmanya Tilak who started Ganesh Festival in Pune. But history has different things to say. Bhausaheb Javale, also known as Bhau Rangari was the one who proposed the idea of Ganeshotsav to Tilak. Bhau Rangari Ganpati Trust celebrates its 127th anniversary this year. You’ll get to do a tour of Bhau’s wada, and take a glimpse into the historic ammunition and secret escapes from the time of India’s freedom struggle. This historical wada, which is more of a museum now, has young welcoming volunteers who patiently guide you through. Also, the trust is known to not collect any donations for the festival. Kesariwada Ganpati happens to be the 5th most respected Ganpati of Pune. Like every year, this year too, the trust is holding a series of exciting events. Hatti Ganpati is known for its tableaus. Tip: Your kids should not miss out on this one. A two minutes’ walk from Hatti Ganpati, this pandal has by far the best replica of any monument. We suggest you visit this soonest, ‘coz given the efforts this Pandal has put in decorations, it’s gonna be crazily crowded. Tip: Visit post sunset to enjoy the glitter.